Product Description: Small-block Chrysler, Plymouth, and Dodge V-8 engines have come in a variety of vehicles since 1964. These powerful, durable engines powered everything from high-performance Cudas and Chargers to torquey Dakotas and Ram trucks. 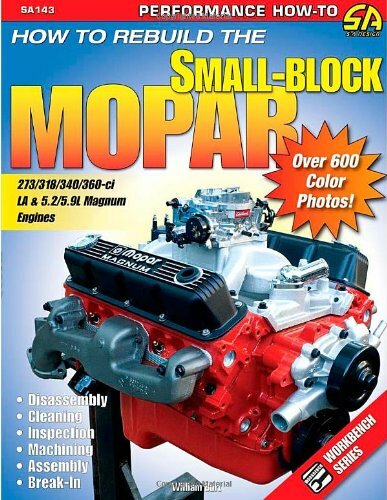 This book describes ways to increase the performance and efficiency of your small-block Mopar, and also points out the unique steps required for LA and Magnum versions of the engine. Topics covered include removal, tear down, inspection, selecting parts, machine-shop work, and assembly. Special sidebars cover torque sequences, cc-ing heads, calculating compression ratio, and painting engine parts.